The 4321 ExpressCard reader from Omnikey (previously the CardMan CM4321) has been developed to meet all major standards such as PC/SC, ISO 7816 and EMV Level 1, and will work in 54mm ExpressCard slots. The reader comes complete with WHQL approved drivers for Windows, as well as support for other operating systems such as Linux. With additional drivers available for download from the OMNIKEY website, it is ideal for many smartcard-based applications on portable computers. 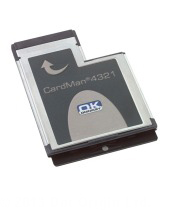 The CardMan 4321 maintains Omnikey's excellent reputation for high quality readers, offering users the capability to manage their various smartcard activities �on the move�. The smartcard slides in partially, leaving an ample amount outside for easy retraction. The 4321 ExpressCard has standard PC/SC drivers for Windows 98, ME, NT, 2000, XP and Vista shipped with every product, whilst Linux drivers are available for download from the Omnikey website. CT-API and Synchronous API drivers are also available for many of the same operating systems from the Omnikey website. Siemens SLE4418, SLE4428, SLE4432 & SLE4442 and others on request.